The 25.48 metre motor yacht Preference, listed for sale by David Westwood at Worth Avenue Yachts in Monaco, has been sold with Maria Alseenko at Maria Yachting introducing the buyer. Built in GRP by UK yard Princess Yachts to a design by Bernard Olesinski,Preference was delivered in 2013. Accommodation is eight guests in four cabins consisting of a full beam master suite with a 32 inch Samsung television screen, a starboard double with a queen sized bed and two twins, all with en suite bathroom facilities. A large open plan saloon has U-shaped seating to port, a three person settee to starboard, a cocktail counter with wine cooler and a dining area with seating for eight guests. The sophisticated entertainment centre includes a 42 inch Samsung television screen and a Harmon/Kardon home theatre system. Outdoor areas are extensive and include a large aft deck with U-shaped seating and a teak table, while up on the flybridge, al fresco entertainment and dining options are excellent. 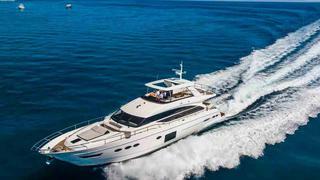 The flybridge offers a helm position, sun pads, a Jacuzzi tub, a bar, barbecue, ample seating and a large teak table. The finishing touch comes from a custom hard top fitted with an electric sliding Bimini top. For truly dedicated sun worshippers, there are sun bed cushions on the foredeck, offering peace and privacy. Twin 1,622hp Caterpillar engines give her a top speed of 33 knots and she is fitted with Trac digital fin zero speed stabilizers.